You are here: Home » Idiom Of The Day » Idiom of the Day – It Stinks! In today’s post, Richard Ford discusses the meaning of the common English expression, it stinks. Watch the video then scroll down the page for some more examples. if you liked Richards presentation of this idiom. It stinks, or to stink! It’s stinks traditional mean something is very, very smelly like [example], “Whoa! This house stinks!” As in, this house is very, very smelly. But we can also use it in slang to mean not very good. For example, “That movie stinks!” [meaning] That movie, isn’t very good. Or, “That actor, he stinks!” [meaning] That actor isn’t very good. So, what in your life stinks? 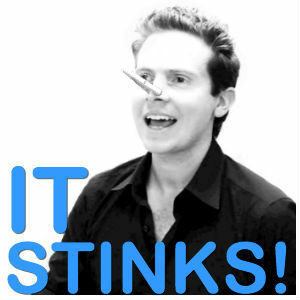 Or what do you think stinks? Please leave a comment below, we’d love to hear from you. Thank you. 1. Did you see John win that last race? It was unbelievable, he was moving like stink! 2. He finished the exam like stink and was first to leave the room. to make a fuss or a big deal about something. To complain about or criticise something. 1. Eddie created a stink about Stuart’s bad behaviour in the bar last night. 2. If you don’t do well in your next English test, Richard will kick up a stink! to make something or some place smell very bad. 1. I love Thai cuisine but Ratana really stinks the kitchen up every time she cooks something. 2. Why do you have stink out the bathroom first thing every morning? It’s really unpleasant, you know? 1. What have you been doing in here? This class stinks to high heaven. 2. I know lots of people like it but I hate durian fruit! They make the supermarkets stink to high heaven!